Reeling from the events of Messiah CompleX, the surviving mutants reassess Xavier's dream amidst the rubble of the mansion. Betrayed by one of their own, and mourning the loss of former allies, is peaceful coexistence still an option? The only thing that's certain is an uncertain future for mutantkind. Is anyone safe in a world without X-Men? Collects Uncanny X-Men #495-499. Well, needless to say, the very first follow up story to Messiah CompleX didn't quite live up to the appeal of its predecessor. 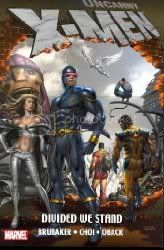 Cyclops has decided to disband the X-Men after the events of Messiah Complex, or has he? Why is he sending some of the X-Men remaining on Earth to San Francisco? And more importantly, why is San Francisco reverting back to the 1960s? And how is this a decent continuation of the great story that was told in Messiah Complex? And what's the point of the story following Wolverine, Colossus and Nightcrawler in Russia? Unfortunately, after such a great comeback (at least in my eyes) that happened with Messiah CompleX, this collection falls short. Hopefully it's just staging the groundwork for some better stories in a new location (San Fran).